Football could be their best shot at the American dream. The first thing the viewer sees is a brawl on a college football field in rural Mississippi. Fists fly and cleats stomp as more and more players, in red jerseys and white ones, join the fray. The ugly footage is from a late-season game for East Mississippi Community College, the best junior college football program in the country, and it was captured for television as part of the outstanding Netflix documentary series Last Chance U. E.M.C.C. is the place where talented but academically marginal players go to earn grades that will qualify them for a scholarship at a big-time football school. 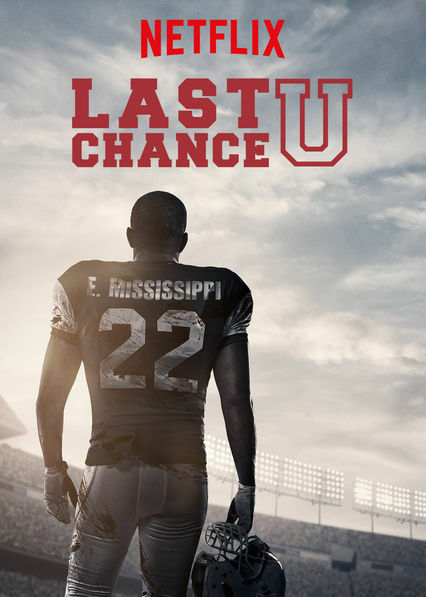 “Last Chance U,” which will appeal to football fans and non-fans alike, covers E.M.C.C.’s 2015 season in beautiful, intimate detail, from training camp to the last day of class. The opening scene offers a glimpse into the constant tension underlying the season: Do the players have a chance to make it big? The fight puts the team’s chance at the playoffs—and thus, the players’ chances to garner attention from bigger schools—in jeopardy. Greg Whiteley, the director of the series, jumps quickly from the fight scene back to the start of the team’s season. As he documents new conflicts—between academics and athletics, between players’ pasts and futures and between coaches’ and players’ priorities—the brawl lingers on the horizon. What leads to this violence? What goes wrong to bring it about? Or perhaps what, embedded in football’s culture, goes exactly right? Whiteley delivers the complex answer with sympathy and seriousness. Football players, and one in particular, have been the subject of some of 2016’s best television. The FX miniseries “The People v. O. J. Simpson,” which dramatized the former running back’s 1995 murder trial, recently won nine Emmy awards. ESPN’s documentary series “O.J. : Made in America” will qualify for both the Emmys and the Oscars next year. The two series capitalized on Simpson’s notoriety, but also on the fact that football touches so many nodes in America’s nerve center, including race and class, fame and greed, violence (including domestic violence) and religion. This season, we are debating freedom of expression because Colin Kaepernick, a San Francisco 49ers quarterback, refused to stand during the national anthem before a game, in protest of police violence against African-Americans. The E.M.C.C. players see football as their best shot at the American dream. Their talent and work ethic are indisputable but possibly insufficient. Running back D. J. Law leaps over tacklers like they are hurdles, but his classes trip him up. He is distracted by the fact that he lives hundreds of miles from his son but is nevertheless glad to be far from the drugs and violence that took down other young men like him. Defensive lineman Ronald Ollie is a near-god in his tiny, impoverished hometown. He has soft facial features and a goofy, homespun demeanor, but when he puts on his pads he can single-handedly destroy his opponent’s offense. You root for him, in the game and in life. Ollie and his teammates get a lot of coaching from Brittany Wagner, the team’s academic advisor and the only woman in the football program. Like the players, she never imagined she would end up in the town of Scooba, Miss., but it is where she can do the most good. While athletic trainers work on players’ damaged knees, Wagner heals the bruised self-confidence of student athletes for whom school is an experience of frustration, self-doubt and humiliation. She makes sure they have pencils and paper for class. She continually prompts them to think of “back-up plans.” It seems incongruous at first when she tells players she loves them. By the end of the series, it is clear that she means it. There may be a bit too much of the Southern gothic in Whiteley’s portrayal of E.M.C.C. and Scooba, with its cotton fields, railroad tracks and broken-down general stores. Buddy Stephens, the head coach, yells long strings of profanity at the team, then invites players to take a knee, touch a teammate’s shoulder and recite the Lord’s Prayer. An assistant coach carries a Bible into team meetings and prays with his players that God will “help them play this game in a violent and vicious manner and the way it’s supposed to be played.” The thick drawls of players and fans sometimes warrant subtitles. Many E.M.C.C. players dream of transferring to Florida State University, where football is a $20-million enterprise. Showtime’s A Season With series follows F.S.U.’s team week by week this fall. With a tight, weekly production schedule, “A Season With” sticks close to conventional sports journalism. Compared with “Last Chance U,” it reveals less of the players’ and coaches’ humanity. It is also telling Goliath’s story. F.S.U. is a consistent winner and sends a dozen players to the N.F.L. every year. The players are highly polished, justifiably confident and fluent in managerial platitudes when speaking to the cameras. Jimbo Fisher, F.S.U.’s head coach, is the program’s downhome chief executive officer, with “Do your job” as his refrain. When offering a player a scholarship, it sounds like he is giving a promotion. He reminds players that “sleep patterns are extremely critical to your success as a football player.” But Fisher also speaks easily of love. After a victory against the University of Mississippi—and former E.M.C.C. quarterback Chad Kelly—Fisher tells his players, “I love every one of y’all.” I believe him, but his love seems different from Brittany Wagner’s. He does not have a wall in his office covered with pictures of himself hugging each player who has graduated. “This game’s not fair,” Fisher says after meeting with an injured star player. One way this is true: for so many players at E.M.C.C., to do the thing they are best at they have to do the things they are worst at. Still, with Wagner’s guidance, they have hope. One of the final scenes of “Last Chance U” is of a huge student athlete skipping down the hall after finding out he earned an A in his composition class. It may be the biggest triumph of the season. This article also appeared in print, under the headline "Field of Vision," in the October 17, 2016 issue. Jonathan Malesic is a writer in Dallas who is working on a book about the spiritual cost of the American work ethic. He can be found on Twitter at @jonmalesic.